Chris Jones (left) of Dedham and Lowes employee Doug Libby lift a new Husqvarna snowblower into Jones' vehicle Friday afternoon in Bangor. 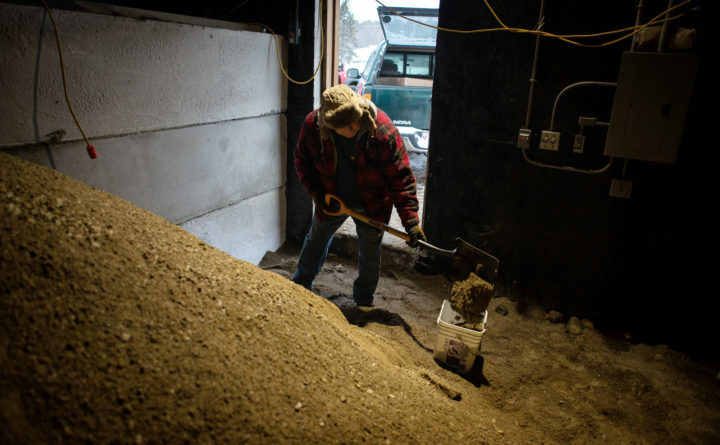 Alan Schreiber of Dedham fills up a bucket with a sand-salt mixture at the town's quonset hut on Friday in preparation for the predicted storm on Sunday. A light snow fell across Bangor on Friday, giving a preview of a much heavier storm that is expected to begin late Saturday and eventually bury the region under more than a foot of powder. The Friday storm brought about a half inch of snow to Bangor by early in the afternoon, creating slippery driving conditions that led to a couple crashes on Interstate 95. Yet that was a dusting compared to the more than a foot of fresh snow that the nor’easter arriving on Saturday is projected to bring. After a sunny — albeit bitterly cold and windy — Saturday morning, the weekend dump is expected to begin in the evening and last until well past dark Sunday night. It should bring between 12 and 18 inches of snow to many parts of central and northern Maine, said Pete Rahe, a hydrometeorological technician at the National Weather Service office in Caribou. Up to 22 inches of snow could fall in some places, according to a storm advisory Friday morning from the National Weather Service. The most extreme weather could come to Washington County. While some of its coastal sections are expected to receive a couple inches of sleet and freezing rain, some of the storm’s heaviest snow will come to the inland parts of the county, Rahe said. So far this winter, 32.6 inches of snow had fallen over Bangor through Thursday, compared with 78 inches so far in Caribou, another meteorologist at the National Weather Service, Mal Walker, said on Thursday. This weekend’s snow will be accompanied by bitterly cold temperatures in the single digits in the north to the low teens south toward Bangor, according to the weather service. The snow is expected to start before midnight on Saturday and create dangerous travel conditions as sustained winds of 15 to 20 mph and gusts as high as 40 mph accompany the snow, Walker said. That will create near whiteout conditions and drifting snow at times, and the service is urging Mainers to avoid getting out on the roads during the duration of the storm. While the snow will begin to drop off late Sunday night, it will continue to blow and drift into Monday morning as high winds whip across the state, according to Walker, likely creating rough conditions for the morning commute for those who have to work on Martin Luther King Jr. Day. On Friday, some area residents were already stocking up on shovels, snowblowers, generators, fuel, salt and other supplies they would need to survive the weekend, according to Katy McWilliams, an assistant manager of the Lowe’s store in Bangor. McWilliams declined to give specific sales volumes for the winter supplies that people were buying, but confirmed that the multiple customers had been looking for snowblowers. 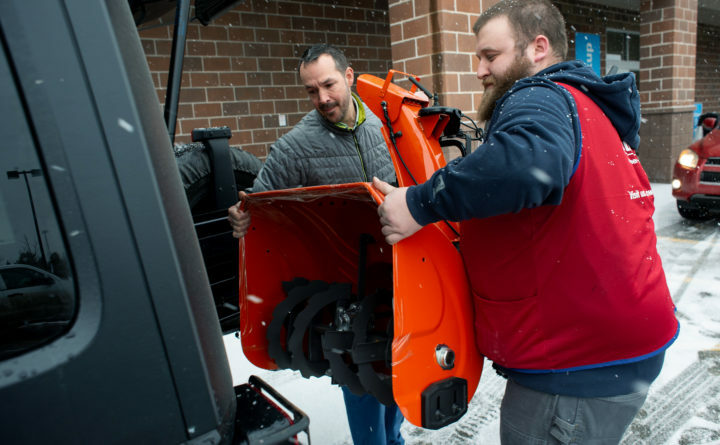 “With the storm coming, I thought it was time to get a new one,” said Chris Jones of Dedham, one such customer who purchased a snowblower at the Bangor Lowe’s. Although the snowfall was light on Friday, it was enough to cause some drivers on Interstate 95 and other Bangor area roads to lose control. Crashes were reported throughout the day. Around 11:20 a.m., a sport utility vehicle headed south slid off Interstate 95 just south of Kelley Road in Orono, according to emergency dispatch reports. A short time later, two vehicles lost control in the northbound lanes of Interstate 95 near exit 183 at Hammond Street, and one of them rolled over multiple times, according to Trooper Toral Nelson of the Maine State Police. No serious injuries were reported, but the driver of the rolled over car was taken to a hospital with minor injuries. Around 2:30 p.m., a tractor trailer jackknifed and slid off Route 1A in Dedham, according to the Facebook page of that town’s fire department. Responders closed part of the road and warned that they could have to close it completely at times. BDN writer Christopher Burns and photographer Linda Coan O’Kresik contributed to this report.